If you have a high deductible healthcare plan (HDHP), then you may have access to one of the best retirement vehicles that you’re not using - a Health Savings Account (HSA). What’s an HSA? An HSA is a tax-efficient savings vehicle specifically designed to accompany a HDHP. Do I qualify for an HSA? If you have a HDHP, then you qualify for an HSA. What qualifies as a high deductible health insurance plan? A HDHP is a plan with an annual deductible of at least $1,350 for an individual (double that for a family). What do you mean by qualified medical expenses? Qualified medical expenses are your medical expenses not covered by insurance including, but not limited to: ambulance services, prescriptions, doctor's appointments, dental and vision care. Additionally, certain health insurance premiums, Medicare expenses, and long-term care insurance premiums are qualified as medical expenses for HSA use. One of the biggest obstacles in retirement planning can be high healthcare costs, which continue to rise and are compounded by a variety of factors. In fact, the Center for Medicare and Medicaid Services projects that the average growth in health spending will be even faster between 2016 and 2026 than previously projected, driven by inflation in the cost of medical services, products and an aging population. While there are many ways to plan and save for future health expenses, HSAs are one of the most tax efficient and underused methods. Contributions made to the HSA can be invested in mutual funds just like your IRA. However, unlike other retirement savings accounts, HSAs are tax efficient in all three phases: contributions, earnings and distributions. All three are completely tax free. This makes them even more attractive than an IRA or Roth IRA. Until the account owner turns 65, the funds in an HSA can only be used to pay for qualified medical expenses. Withdrawals used for non-qualified medical expenses prior to this point are subject to income taxes and a 10% penalty. 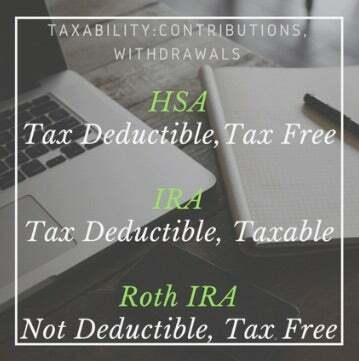 However, after the age of 65 or Medicare eligibility, withdrawals for non-medical expenses are no longer subject to the 10% penalty, though they are subject to income taxes (just as they would be from a traditional IRA). This feature allows many people to utilize their HSA as another retirement savings vehicle, especially because there are no income limits on contributions. Another factor that has made HSAs popular is that the distributions (which, again, are tax free) are not required to be taken, unlike a required minimum distribution from an IRA or 401(k). As a financial advisor, tax-free and no required minimum distributions are two factors that can always make me smile.